← PAN w Z-nem (21 Eng): Homage to Jean Piaget : “Professionals of No Knowledge”, the Zoological Origin of “Chosen People”, etc. In case one does not know how Protestant 5 Solas have originated, I recall that Martin Luter has sublimated them from of teachings of St Paul, who boasted himself to be “Hebrew from Hebrews, according to Law a Pharisee” (Phil. 3: 5). According to Anthony Grigor Scott(https://en.wikipedia.org/wiki/Bible_Believers) everything of importance, which fills books of Moses in Old Testament, was inserted into “Letters” of St Paul – and subsequently into the canon of books of New Testament – by the decision of the Council of Nice in 325 AD. To obtain the wider acceptation of any scientific idea, its receivers should have their individual associative apparatus appropriately tuned-up for its reception. In the Anglo-Saxon culture men are (were) grown since childhood with the lecture of the Bible, and thus the reality they perceive is in a large extend modelled by “directing truths” of the Holy Scripture. This fact, well known in the developmental psychology and neurology, is sufficient to explain both the genesis and the commercial success of contemporary Darwinian concepts of evolution. (…) The whole neo (and ultra) Darwinian theory we may thus reduce to the natural selection (see pt 1) of bodies grown from hazardously created variants of seeds (pt 3). It means that the totality of contemporary concepts of evolution we may deduce logically from few simplified sentences incorporated into both the Old and New Testament. Those concepts are cognitively “empty”, but nevertheless they are impressing laics in a similar way as the ordinary Jews were impressed by the empty interior of Jerusalem’s Temple. And we are invited to hate all those who demonstrate the cognitive emptiness of Darwinian sciences, in the very same way as Pompeius was hatred by Jewish priesthood for his act of tearing-down the cover hiding emptiness of the famous Hebrew Temple of Misologos. 3. And one more important remark. My “comrader in arms” Israel Shamir (http://www.adelaideinstitute.org/Dissenters/shamir1.htm) since already more than decade pretends that the “civil society (“liberalism”) is the JUDAISM WITHOUT THE NOTION OF GOD. The Darwinism – especially in its “neo” form – is the expression of the ideology of LIBERALISM – thus NEODARWINISM IS JUDAIST THEORY OF EVOLUTION WITHOUT GOD - see the recent book of the author of “Egoist Gene” and “Blind Watchmaker”, Richard Dawkins’ “The Illusion of God”. Darwin was undoubtedly a bourgeois searcher which helped consciously or not to promote the economic liberal ideology, but the pure materialist analysis leads us to take also into account the fact that now the antievolutionist (and of course the creationism) movement is directly linked with the imperialist centers tending to corrupt from inside socialism, christianity and islam. Within darwinism there is something progressive and something reactionnary, that’s the way we have to see it. MG’s comment: – My mentor in evolutionary sciences Pr Pierre-Paul Grassé has argued, I quote Wikipedia, that « evolution is in his opinion a process which is not necessary, it does not occur in living beings under the constraints of external physical forces. To explain evolution he instead thinks that you must look at the internal dynamics of living things. » Moreover, Grassé frequently repeated (also to me personally in 1979) that « Darwinian mutatio-selectionist concept of evolution, if one looks closer at it, it reveals itself to be about NOTHING, … Darwinians consider an accident to be a kind of a Providence, to which they are not giving the name, but which they worship in a secrecy. 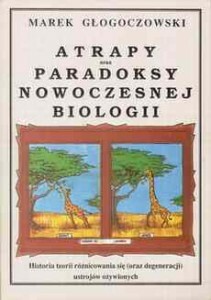 » In my, completed already 32 years ago research on this topics, I stressed that “looking like true” Darwinian Theory is a scientific DUMMY (in Polish “Atrapa”) of evolutionary process. The reason of incessant propagation, since more than 1,5 century, of such “higgledy-piggledy theory” (John Herschel, 1859), remains in this DUMMY SCIENCE aptitude to hide results of pathological behaviors of so-called “civil society”, aggressively worshiping the “holy Trinity” of Wealth, Technics and Comfort (these are so called WTC Western Values, in Slavic languages in abbreviation TPD/Zh: Technics, Pieniadz, Dupa/Zhopa). According to “pure” Darwinism, which is purged of traces of Lamarckism, all biological and cultural “improvements” in Universe have happen BY A CHANCE ONLY (by „a Divine Providence”, as said it with irony P.-P. Grassé). Such Scientific Theory denies whatever value to individual life activities, from the viewpoint of The Holy Evolution everything important is decided „from outside”, by external mutatio-selectionist forces. Such NIHILIST CHARACTER of neo-Darwinism is, in all evidence, culturally inherited from the famous religious assertion of St Paul „you are saved (for the life in Eternity) not by your works but BY GRACE ONLY”. In the previous Post Scriptum (of Sept. 13) I’ve pointed that „5 solas of Judeo-Darwinian Faith” are trivial adaptive mutations of „5 solae” of Lutheran Creed purged from the notion of God. In order to demonstrate up to which point the nihilism radiates from such ANTIZOOLOGICAL scientific attitudes, it is sufficient to quote once again the famous linguist Noam Chomsky, who pretended, in late 20th century, that “Essential aspects of our mental and social life, among them also the language, are determined as a part of our biological endowment, and they are not acquired by a process of learning and in particular by a training”. Chomsky behaved like a nasty boy, throwing scientific sand into our eyes. WITHOUT TRAINING our biological endowment, among it our linguistic skills, UNDERGO ATROPHY: for this September “Mut zur Ethik” meeting I prepared my lecture in French, in an effort to avoid the evanescence of this my faculty of speech, not much exercised since nearly three decades. Autism is a relatively new disease (Charles Darwin and Albert Einstein had symptoms of it), and its epidemics has its centers in rich suburbs of developed countries. And already few years ago my colleague Bruno Drweski (born in Canada) has wittingly observed, that “Anglo-Saxon nations are autistic by their nature” – thus no wonder that parents behaving in an autistic way are giving birth to children behaving in even less social manner. But why do such experienced microbiologist as Luc Montaigner is not making this trivial to me (and to Bruno Drweski) association? In 1981 I had an occasion to speak with collaborator of Luc Montaigner, Pr Daniel Zagury, an immunologist from Paris VII University, who told me that my “Lamarckian” explanation of origin of cancers, as a kind of „opportunist invasion” of an organism by its own not-yet-matured cells, is indeed a very broadminded one – but it will be extremely difficult to publish it in journals narrowly specialized in oncology. And surely also the Nobel Prize Winner Luc Montaigner feels the pressure of the „authority from above”, which inhibits him to speak – and perhaps even to think – about “layman’s” associations between appearance of autism, and the sterile life style of parents and fore parents of autistic children. In all evidence he avoids to make logical conclusions from association of the fact that like other civilization illnesses (in particular diabetes and asthmas) autism is a behavioral deficiency caused by several point mutations at different loci in patients genomes. Such an association suggests that it exist a “Lamarckian” method of getting rid from the autism plague – in the same manner as it is possible to do it in case of several other similar diseases. Namely, epidemiological statistics demonstrate that not only asthmas are very rare in case infants since their birth are grown in not sterile environment of farms. Also diabetes may be cured: in 1970ies I participated in Geneva in a conference during which a physician from Germany informed us that during the 1WW, when in Germany was a severe food scarcity, 80 % of diabetes simply disappeared! So organisms – and in particular human organisms – have the “metaphysical” capacity to heal appearing in them, leading to hereditary illnesses, micro-mutations. Why do Montaigner is not advocating the promotion of a “counter WTC cult” as a method of population sanitizing? It is a “signum temporis” (a kind of mental illness of civilization!) that “professionals of no knowledge” are trying to associate autism with vaccinations: it is exactly the opposite, I’ve read that statistics (in England as I remember) demonstrated that autism occurs less frequently among vaccinated children than among these not vaccinated ones – which is logical: vaccines are IRRITATING hormetic agents, which “wake up” in children more complex immunitary behaviors, which without these vaccinations may remain “asleep”. It is the ELEMENTARY ZOOLOGICAL PHENOMENON of IRSA*, the same one which caused the sensible diminishment of number of infants cancers after irradiations following the Tchernobyl Nuclear Plant accident in 1986 – please read carefully “Radiation hormesis: a remedy for fear“. I hope that some of its readers will grasp the essence of a LUCIFERIAN** HORMESIS CURE I suggested in this “Post Scriptum to Homage to Jean Piaget”. * I recall that IRSA is an abbreviation of the name I gave to an automatic sequence of biochemical feeback reactions to any kind of a stressor: Irritation – Regeneration – Superregeneration – Association of (super)regenerated proteins and nucleic acids. ** “Lucifer is a true god as opposed to Jehovah” – hence by a logical deduction, Jehovah/Jahve is is the god of Mind Darkness, which characterises worshippers of OT, NT, and neo(Judeo)Darwinian paradigm ( ) see works of Richard Dow(n)kins et al ). This entry was posted in Ad PODHALAŃSKA AKADEMIA NAUK, ENGLISH TEXTS, genetics of bio-development, TEXTES EN FRANCAIS. Bookmark the permalink.